‘This project could very well change the way we think about gun control and consumption,’ the organisation says on their website. Cody Wilson, a spokesman for the so-called ‘Wiki Weapon’ project, told guardian.co.uk that the organisation is only waiting on a license to allow them to legally manufacture firearms in the U.S. They have already come up with two blueprints for plastic firearms, but now needs to test the designs to ensure they are safe to use when printed on less-expensive 3D printers. ‘These guns will be almost completely plastic, so melting and failing in your hand will be a concern,’ Defense Distributed says. The group so far claims to have developed two prototype plastic handguns. The first, called Wiki Weapon type A, is a training gun with no moving parts. It relies on an electrical solenoid to fire bullets but the rest of the weapon is 3D printable. The more ambitious Wiki Weapon type B will have movable parts, but the organisation hopes to refine these to make it possible to print them on entry-level 3D printers that can be used at home. They promise that blueprints usable in computer aided design programs will be available to download from their website ‘in the coming weeks’. A third project allows users to print the regulated part of an AR-15 submachine gun, then build the rest from unregulated parts freely available in U.S. gun shops. The researchers behind the Wiki Weapon project had initially hoped to create and test their prototypes without a licence, but intense media interest has led to problems which threatened to derail their progress. The group’s account on crowd-funding website Indiegogo was in September frozen and nearly $2,000 already raised was returned to donors and last month the company from which they had planned to lease the equipment to create their first prototypes repossessed its printer, the Guardian reported. Two Texas-based companies, whose names are not known, have since volunteered space and a 3D printer for the Wiki Weapon team to carry out manufacturing and ballistics testing. The organisation, which began as a loose online collective, has restructured and registered with the U.S. government to ensure there are no more legal barriers. Bypassing regulation: Printable plans for this lower-end receiver part for an AR-15 submachine gun are already on offer from the organisation. 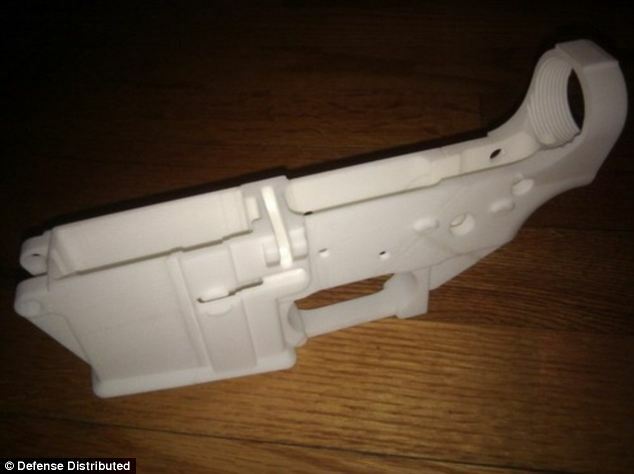 Once printed, the rest of the gun can be assembled from parts freely available in shops in the U.S.
Wiki Weapon’s designs are intended for printing on the kinds of 3D printers available to hobbyists, such as the RepRap – a low-cost open source prototyping system designed to be easily distributed. The people behind the project see it as the ultimate expression of free speech, with the advent of 3D printing representing the kind of advance that the orginal printing press gave to society. Answering the question ‘why guns?’, Defense Distributed says on its website: ‘Guns prove out some of our younger generations’ beliefs about information and sharing at an extremity. 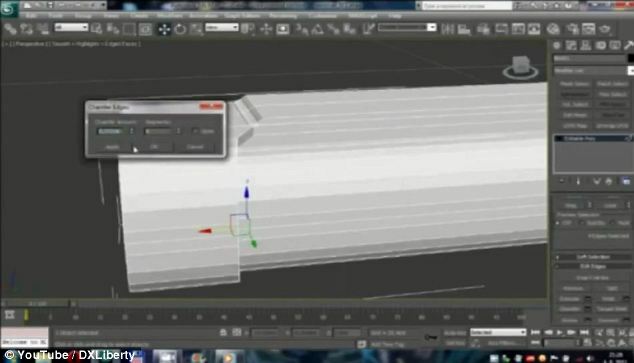 Mr Wilson added: ‘Consider this: a CAD file containing the information for a 3D printable weapons system. ‘If that file was seeded by 30 people, let’s say, as long as there is a free internet thhat file is available to anyone at any time, all over the world. ‘But Defence Distributed’s goal is not really personal armament, it’s more the liberation of information. It’s about living in a world where you just download the file for the thing you want to make.